This PDF 1.7 document has been generated by Adobe InDesign CS5.5_J (7.5) / Adobe PDF Library 9.9, and has been sent on pdf-archive.com on 25/12/2015 at 07:52, from IP address 5.18.x.x. The current document download page has been viewed 705 times. File size: 2.7 MB (8 pages). meeting all the requirements of production lines thanks to rapid takt times. 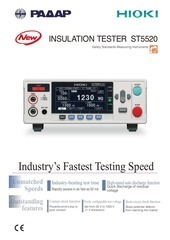 faster than legacy Hioki models. improvement of 990 ms is estimated. this can result in erroneous assessment. 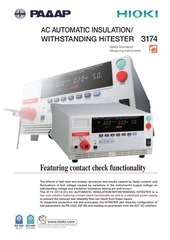 check and comparator contact check. voltage used varies with the manufacturer. the test voltage to be freely configured. and the high output terminal, is verified. the keys and verified on the screen. m o d e l s . . .
500 V / 1000 V.
for micro-shorting prior to insulation testing. by specifying the preferred response time. protrusions could cause issues after the product ships. current sourcing output (PNP) by configuring the switch. assessment results at the end of each test. voltage through its analog output terminal. Checking the Control I/O Signal No. the output signal state can be viewed on-screen. 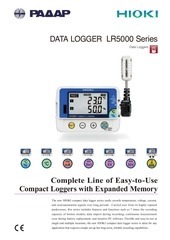 increase by a maximum of 500 ms.
as the test is completed. the set response time has elapsed. No measurement values are displayed during the response time. The response time is included in the test time. *Test Lead L2200 can be extended. 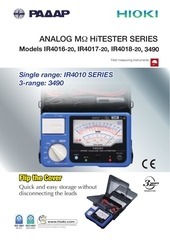 Please contact your nearest HIOKI distributors. Note: Company names and Product names appearing in this catalog are trademarks or registered trademarks of various companies. 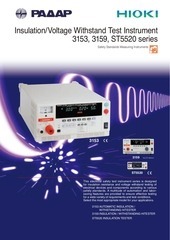 HIOKI (Shanghai) SALES &amp; TRADING CO., LTD.
All information correct as of Mar. 15, 2015. All specifications are subject to change without notice. This file has been shared by a user of PDF Archive. Document ID: 00326722.